Hands down, this is the Best Devil’s Food Cake Recipe ever. It’s incredibly easy to make, it’s moist, airy and has a super rich chocolate flavor. It’s one of my absolute favorite recipes and tastes almost too good to be made from scratch at home! 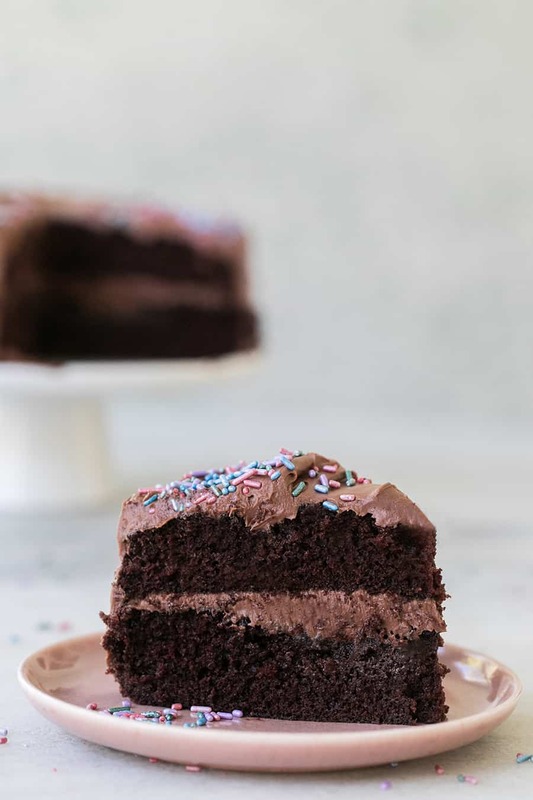 I’m always searching for good, classic chocolate cake recipe and this is by far the best Devil’s Food Cake recipe we’ve made and may be your go-to chocolate cake recipe from here on. The sour cream frosting is creamier than anything I’ve ever had and the cake is perfect for any occasion, especially birthday parties or even a Halloween party, given its devilish name! It’s delicious paired with a warm cup of coffee like our Almond Joy Coffee. And if you like Devil’s Food Cake, then you’ll love our over-the-top Heaven and Hell Cake! It’s Devil’s Food Cake layered with Angel Food Cake and has peanut butter in it! Hello. The flavors of a chocolate cake and Devil’s Food Cake are similar. A Devil’s Food Cake is richer, darker and fluffier than regular chocolate cake. A Devil’s Food Cake recipe also uses cocoa powder to get the rich chocolate taste. In the past, the difference between a Devil’s Food Cake and a Chocolate Cake was the amount of chocolate and baking soda used. Devil’s Food Cake had more baking soda for the cake to rise and also created a reddish color to the batter. With so many different versions of chocolate cake and Devil’s Food Cake, the two can taste pretty similar. How to make the best Devil’s Food Cake? To make the best Devil’s Food Cake follow our recipe below. 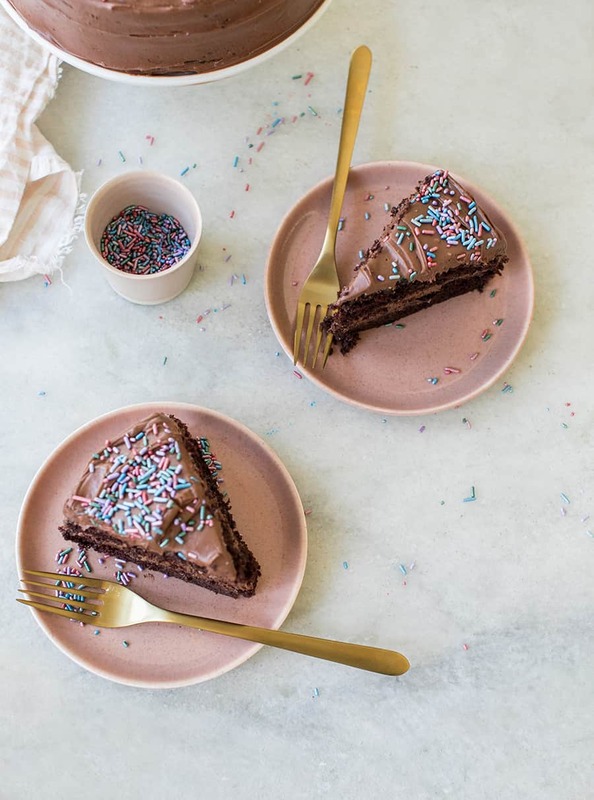 Using high quality ingredients like King Arthur flour, organic eggs and butter, quality cocoa powder will all make a difference in what the cake will taste like. Check dates on ingredients and make sure nothing is expired, like baking soda. Also, sifting the dry ingredients together is important for creating a lighter cake texture. I always add all of the wet ingredients, oil, eggs and buttermilk in a liquid measuring cup and whisk with a fork. It makes it easy to add to the dry ingredients. Not over-baking the cake will also help in making the best Devil’s food Cake and keeping it moist. 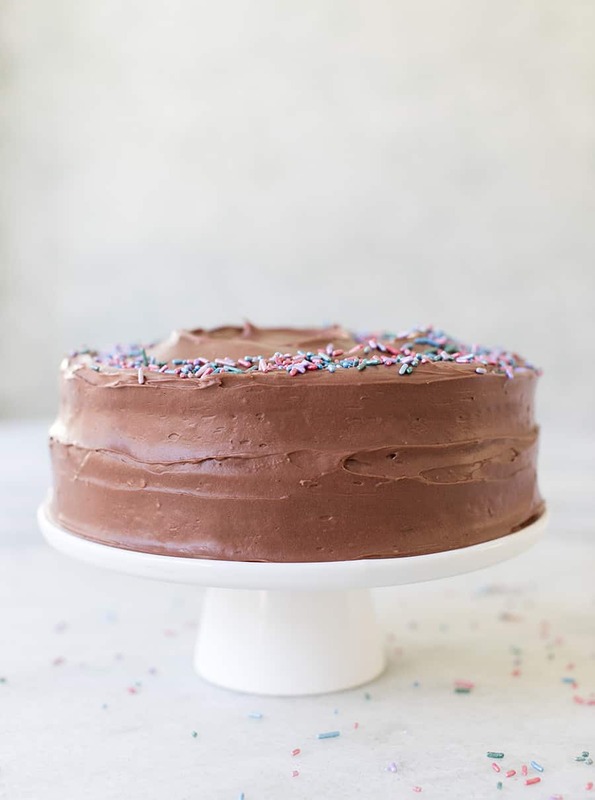 This cake isn’t anything without the very best Devil’s Food cake frosting! 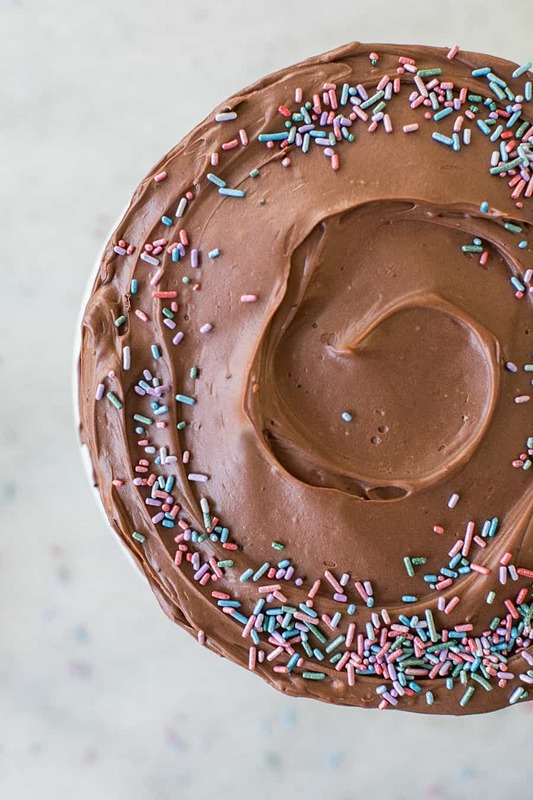 This chocolate frosting recipe is unique because it’s made with sour cream! Yes, sour cream! Who knew this would be the secret ingredient to making a smooth, rich and creamy chocolate frosting. It’s so good you’ll have to contain yourself from eating the entire bowl before it makes its way to the cake. The recipe uses bittersweet chocolate, butter, powdered sugar and a cup of sour cream. You can find the recipe here! It would also pair well with any of our other cakes or cupcakes. 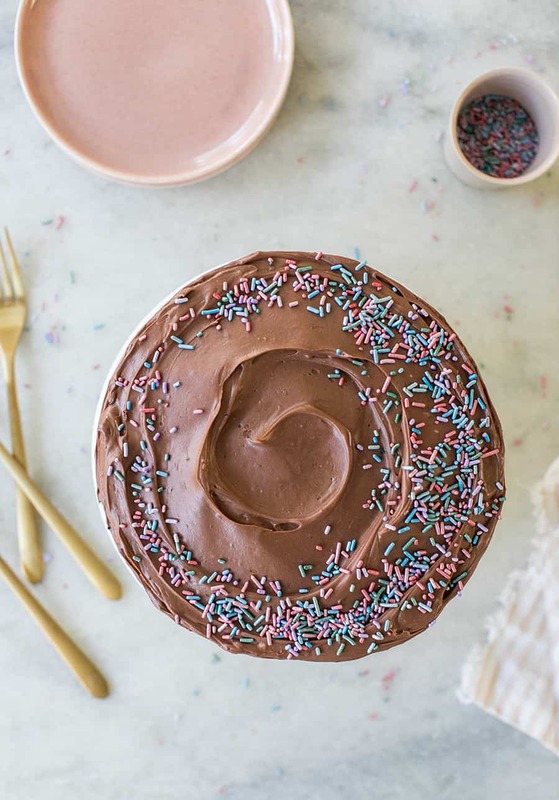 To garnish the cake and add a little color, top it off with some Fancy Sprinkles! What does Devil’s Food Cake Mean? It’s actually not fully known how Devil’s Food Cake got its name. There are a few speculations like it’s the opposite of its counterpart Angel Food Cake, which came out before. It could also be that it’s filled with “sinful” chocolate and has a way to lure people to its dark side, ha! I would say it’s because Angel food cake was around before and this is similar but with cocoa powder. One tip – This batter is like liquid, but trust it…It bakes up nicely! Let is know if you make this recipe and leave a review below! We would love to hear your thoughts! This cake is super moist and rich in chocolate flavor. Easily our favorite chocolate cake. Boil the water in a sauce pan. Move from heat, add in cocoa powder whisking with a hand whisk constantly until the cocoa is melted. You might need to put it back in the burner for a minute. It's easy to burn, so watch closely. Remove from heat and set aside. Add the wet ingredients to the dry while mixer is on medium. Mix until combined. Pour the batter evenly into two oiled 8 inch round cake pans. Line with parchment paper if you want. Bake in a 325 degree oven for 20-25 minutes until the cake is not jiggly in the center. Let the cakes cool while you make the chocolate frosting. Hi Eden, this recipe looks great and I can’t wait to try it. Quick question – do you use sweetened or unsweetened cocoa powder? Thank you Sarah for letting me know!! It’s unsweetened and I will fix it right now 🙂 I hope you love the cake! It’s honestly one of my favorites!! I made this for my husband’s birthday cake last night. The batter was really thin – I kept re-reading the recipe hoping I hadn’t messed it up. I considered thickening it, but decided to stay true to the instructions. It turned out perfect! Everyone raved about it. I also made the frosting recipe. The only thing I changed was reduced the sugar to taste, as we don’t like things too sweet. Hands down, everyone who ate it said it was excellent. Love, love, love the frosting! Finally a frosting that I like. 🙂 Thank-you! With a sour cream frosting, does this cake need to be refrigerated? I normally make cakes and put them in my pedestal cake keeper plate on the dining room table. Made this today followed directions exactly and it turned out so yummy. Was in the mood to bake and wanted to try this cake so glad I did. I made a butter cream icing only because I didn’t have sour cream. It was just as good on the cake. Will be using this recipe again. Hi Julie! Thank you so much for leaving such a sweet review! I am thrilled the cake turned out for you.. it’s one of my favorites! I will have to try it with buttercream too!